I find it annoying when someone says, “I’m sorry if I offended anyone.” That’s no apology! They’re only sorry that someone took offense! In other words, the person who took offense has the problem, not the one who caused the offense. If no one was offended, the offender wouldn’t feel the need to apologize at all. Furthermore, there’s no suggestion they will do anything differently in the future, and there is no hint of any intention to make things right. They are simply sorry that someone has a hurt feeling! A second form of unapologetic apology is to believe that “It is better to ask for forgiveness than to ask for permission.” People who say this aren’t sorry at all. They got their way, so they’re happy. They disrespected everyone else who should have had a say in the decision they made. At best, they are counting on your goodwill to prevent any negative fallout for themselves and at worst this is spiritual manipulation, knowing that you will probably feel it is unChristian to withhold forgiveness. If a senior leader does this repeatedly to the board, then he or she is intentionally circumventing both the oversight and the policies of the board and can hardly be thought to be apologizing. Leaders are in a place of formal authority over other people. They run the risk of being corrupted by the power that comes with their authority and running roughshod over people. If power goes to their head, they are setting themselves up against God, who has said, “For all who are mistreated, the Lord brings justice (Psalm 103:6). A readiness to apologize is one way a leader can keep the misuse of power in check because apology is an equalizer between people with different degrees of power. Apologies acknowledge the rights that God has endowed every human being with, regardless of position or title. 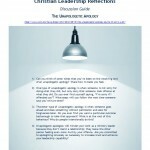 Leaders represent an organization to the public, and if they don’t apologize publicly when they should, the entire ministry can suffer reputational harm as a result. An aggrieved person might say, “Oh, ABC Ministries? They’re the ones who think it is okay to…” No organization can put up with a leader who doesn’t apologize well! This topic came up because a Harvard Business Review article really intrigued me — Why “I’m sorry” Doesn’t Always Translate. One of the author’s points is that in the U.S. an apology is seen as an admission of wrongdoing (“I am the one who is responsible”) while in Japan an apology is seen as an eagerness to repair a damaged relationship (“It is unfortunate that this happened”). It got me thinking about what makes an effective apology. What are we trying to accomplish when we say, “I’m sorry”? “I’m sorry” can be an expression of sympathy for a particular person or group. Sympathy comes from the Greek words sym (meaning together or with) and pathos (which means both emotion and suffering). To be sympathetic is to identify with another person’s emotion or suffering. When we use “I’m sorry” in a sympathetic way, it is not an apology at all but a way of saying “I share your emotion.” You are saying, “I’m suffering with you” or more colloquially, “I feel your pain.” The Latin translation of sympathy is compassion. “I’m sorry” can mean regret, as in “I’m sorry it has come to this.” This seems to be the way the Japanese are using the word to apologize. Finally, “I’m sorry” is an expression of sorrow for having done something wrong, which is the American meaning for apology. I’m writing about the third meaning of sorry. I haven’t been able to find the words apologize or I’m sorry in the Bible. Instead, biblical apologies are found by looking up forgive and confess. Asking for forgiveness carries with it an admission that a wrong was done. The biblical model for apology is for the wrongdoer to express sorrow, confess the fault, repent, and then ask for forgiveness. On the flip side, the aggrieved person is expected to forgive the person upon hearing their confession. Whether or not forgiveness is received, the offender needs to change their thoughts, attitudes, outlook or direction in order to reorient their life and behaviour to a more godly way. If a person really is sorry, that person will change so it won’t happen again. You can’t say, “Well, that’s just who I am” and expect people to be satisfied with that. Our faith is about becoming Christ-like, not about remaining permanently in the state we were in when we found Christ. Numbers 5:7 contains God’s instruction that an offender will not only confess the wrong and make it right, but will also pay a penalty of 20% of the damage so that the wrong actually costs something. Applying that to apologies today means that you should be generous in your restitution. Don’t be mean and stingy with your apology. Go overboard so that your words and actions together make a full restitution and then some. Admit that you recognize the wrong that was done and express regret for it. Acknowledge your part in the wrong. Do not talk about the other person’s responsibility (if there is any) for the wrong. Don’t make excuses (“When you said…, that made me…”). Never ever say “But…” Own your behaviour. No matter what the provocation, if you wronged someone, that was your choice. Don’t put any blame on the other person. Leave it to them to decide whether or not they will apologize for their part (if any). Suggest how you can make things right and restore the relationship. Mend your ways so you don’t need to apologize a second time for the same behaviour! Some leaders wonder if saying “I’m sorry” will display weakness and undermine their ability to lead. I suggest a sincere apology will accomplish exactly the opposite. If you’ve caused offense, believe me, everyone who was offended or who observed the offense knows you are at fault. So the fact that you did something that needs an apology will not be news to anyone. If you don’t apologize, these people will think worse of you. Mark Twain once said, “Always do right. This will gratify some people and astonish the rest.” If you do the right thing and apologize, people may be surprised that you were transparent and vulnerable enough to admit the error, but it will be a pleasant surprise and increase their trust that you will always do the right thing. That trust enhances your ability to lead. For an example of a well done public apology, see this post by John G Stackhouse. If you have a story of a really well done apology you could share, please share it. You don’t have to identify anyone involved and we could all learn from and be inspired by what others have done. This is an important post John. Our culture seems to have embraced the apology as some sort of badge of honour (how many celebrities do we see making “apologies” these days? ), but as you say these are often not true apologies at all. So important that leaders get this right. I recently had a meeting with the elders and a couple of pastor’s at my church. During that meeting, the discussion got out of hand and things were said by several of them that should not have been said. I left that meeting very upset and disappointed at the behaviour of several of the men. Several weeks later I received a written apology from one of the Pastor’s. It was the most sincere and spiritually filled apology I have ever seen. He started off by saying that he had been reading in the book of Proverbs and was very convicted by some of the scripture (he listed them and quoted all of them). He then went on to say that The Lord had been convicting him about his attitude towards me that night and that he was now coming before me as a friend to ask for my forgiveness of how he spoke to me that night. He then went on to share about four principals of forgiveness (we had a fall out many years ago and I apologized for that several times, but it was still a stronghold in his life at this point). He then confessed that he had broken all 4 principals and was asking for forgiveness on these points as well. His letter was love filled, sincere and truly humble. His letter came from the bottom of his heart and he poured it out with great humility. A letter like this makes all the difference in how we respond to those in leadership. It shows us that they are real and just as vulnerable as the rest of us to sin. A letter like this also restored my faith in him as a leader. Authentic apologies are absolutely critical for restoring and rebuilding trust within the church community. My prayer is that more people in leadership rolls would respond the way this pastor did and not give these shallow “well if what I said offend you, then I’m sorry” sort of apologies. These sort of apologies are about as deep as a puddle and have absolutely no sincerity. There must be true and sincere repentance in order to have true and sincere forgiveness. Only then can moving forward begin. Thank you for sharing your story, Joelle. This is an inspiring account of sensitivity to the Spirit, Christian reflection, and godly reconciliation. It’s really nice to see it at its best. I’m sure others will be both inspired and convicted by this pastor. How do you know when someone is really sorry? By how vulnerable they make themselves. A sorry with defensiveness or excuses is not sorry enough. Well said! Thanks, Ken, for that very simple but profound point.